Nose: Gently fragrant on the nose with lovely fruits - apricots, peaches and green apples. 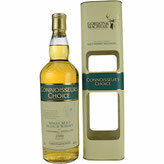 Plenty of vanilla with sweet honey, tender green grassy notes, and a hint of oak in the back. Palate: Surprisingly peppery on the palate with oak spice and a hint of clove. Quite warming indeed. Sweet notes of honey and vanilla ermerge, lingering with tender yellow fruitiness and a touch of banana towards the finish. Finish: The finish is long, warm and creamy with honey, apricot jam and subtle dry oak on the tail. With water: Water significantly increases the fruitiness on the nose with more apricots, peaches, banana and lemon coming through. Creamy with vanilla and delicate toffee. Water slightly tames the spiciness on the palate with creamy honey and a touch of fruitiness in the back, followed by very dry oak towards the finish. The finish is still long, fruity and sweet with a slightly woody dryness. 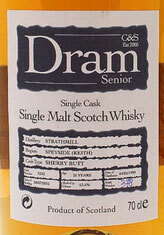 Comments: A nice dram with an appealing nose and some interesting fruity moments. Surprisingly spicy and dry on the palate as the wood obviously has taken charge. Water tames the spiciness in favour of the woody dryness though. Nevertheless, an easy drinking malt. Nose: Mature on the nose, fruity with prunes, ripe yellow pears and red gooseberry. A fragrant sherry note in the back with lingering marzipan, a touch of raisins and gentle vanilla. Then even more vanilla arrives accompanied by light butterscotch. Very complex albeit a bit faint-hearted. This one needs a significant amount of time to display its full aroma. Palate: Round and strong. Sherried fruit with a whiff of herbal bitterness. There's a hint of sulphur showing up for a second or two, before lingering marzipan and a touch of nuttiness take over. A palatable oiliness with no oaky edges. Finish: Long and warm with a fruity sweetness. Subtle sherry with dry nutty flavours on the tail. Nicely rounded. With water: Now the whisky awakes. It is fresher on the nose with increased fruitiness also on the palate. The bitter herbal notes is completely masked by water, leading to a long, warm and dry sherried finish with gentle Strathmill's muscat note. Comments: Very nice indeed with a rich and complex character. A bit reserved nose with a bold and aromatic palate. Time should be taken to appreciate this delicate and diverse whisky. Sip and relax!